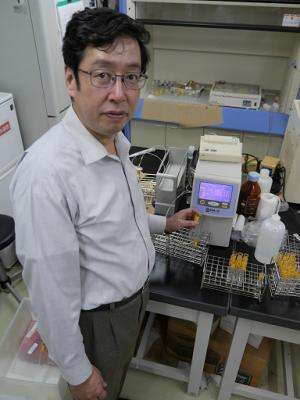 Professor Takanobu Inoue of Toyohashi Tech's Department of Architecture and Civil Engineering has been conducting field surveys of mercury poisoning in Indonesia for over a decade. His findings have serious implications and the situation is not improving. "The main source of this pollution today is small-scale gold mining," says Inoue, who is an expert on water environmental engineering. "Gold mining is easy to learn and simple to operate, so for people living on the poverty line, it offers hope for the future." When there is no sophisticated technology available, gold mining involves simply mixing mercury and water with gold ore to form an amalgam. The mixture is then heated to remove the mercury by evaporation—most likely without any filtering— leaving behind the gold, while the water containing mercury residue is usually discarded directly into rivers. Mercury is a heavy metal that can cause disability and death to miners, and to their families who become exposed to it through contaminated clothing and other items. Chronic poisoning can result in damage to the kidneys and the reproductive system, while the lungs and central nervous system can also be severely affected. "It is necessary to educate the people on the dangers of mercury poisoning," says Inoue. "But there are few environmental researchers in the country, and the equipment they have to test for poisoning is limited, as are funds and government support." As a result, quantitative information on the extent of mercury pollution each year is scare and often inaccurate. The United Nations Environment Program, for instance, estimated that in 2011 approximately 70 tonnes of mercury was discharged into the environment. "But this UN figure is based on the import of mercury into Indonesia," says Inoue. "It does not take it account illegal imports, so the actual figure is certainly far higher." Inoue has been sharing his findings with individual professors of several universities in Indonesian. He is encouraging them to join the Indonesia Society of Water and Aquatic Environment, where information can be shared and scientific papers on pollution presented and published at conferences. To help impress on his Indonesian colleagues the dangers that exist, Inoue describes findings on the Minamata disease that was discovered in Minamata city, Japan, in 1956. It was caused by the release of waste water containing mercury pollutants into Minamata Bay by a local chemical company, where it was ingested by marine animals, which were subsequently consumed by humans. "We need research institutes to collaborate with each other to facilitate a comprehensive study on mercury pollution in Indonesia," says Inoue. "Such cooperation will enable monitoring of mercury concentrations in gold mining and the impact of this environmental pollutant on local people."